The initial post about the survey has generated significant discussion; although it seems very straightforward, Raj seems convinced that the questions should be interpreted differently. The following questions (10 and 11) are not limited to those who responded “yes” to question 9 — those who indicated that they do most of their non-grocery shopping outside Oak Ridge; it includes people like me, who do most of our shopping in Oak Ridge, but invariably have to go elsewhere for some things that simply cannot be purchased here. My only doubt about the survey is now knowing that Raj’s house was called twice (because he has several land lines), while mine was not called. Half of two-thirds is one-third, plain and simple, just like half of two is one. I’d love to know what the survey would have said after people attended the several informational meetings that occurred following the survey, but there simply wasn’t time to wait. One thing the survey does tell us is that the more information people have about the return on investment, the more likely they are to be in favor of it. The picture’s a little fuzzy, but that’s what it really looked like to me, since I hadn’t had my first cup of coffee yet when I snapped it. Actually, it’s a good reflection of the last couple of days. There seems to be a real sense among legislators that some part of the tobacco tax will pass, that some improvements will be made to education funding… just no consensus that the Governor’s proposal will pass as written. One thought conveyed by someone well-credentialed in his knowledge and influence of fiscal policy was that some part of the tobacco tax will pass — maybe 20 cents, maybe a little more. I asked what would be cut from the Governor’s proposed education funding improvements, and he thought that the funds could be found from cutting other discretionary items, other than education. Of course, there are the usual bills we’ve seen before: elected superintendents, forcing a conversion to the TACIR system-level BEP model, requiring this our that instruction, various things about charter schools… I’ll cover those as they come up. Time to head home now; I’ll cover it more later. 1 comment Tuesday 27 Feb 2007 | Netmom | Etc. The survey sponsored by the League of Women Voters is in. Under the condition that City funds committed to the project would be repaid through future tax revenues, respondents are more likely to view the proposal favorably, but remain sharply divided on using City funds to support site development for the shopping center. Under the condition that future tax revenues from the shopping center would assist the local schools, respondents are much more likely to support the proposed C8ty assistance to the project, but still about a third of respondents remain opposed to the idea. Older persons and males are more likely to oppose the City’s financial involvement in the shopping center project. But, who does the majority of the shopping? Younger people and women, perhaps? To the question, “if the revenue produced by the shopping center would provide new money for the Oak Ridge Schools, Anderson County Schools, and Clinton City Schools, should the City agree to this request (for $10.5M in City financial assistance), the weighted response was 52% in favor. Without question, the results are far from the decisive and positive as I had hoped. Courtesy of the League of Women Voters, you can read the whole thing for yourself. 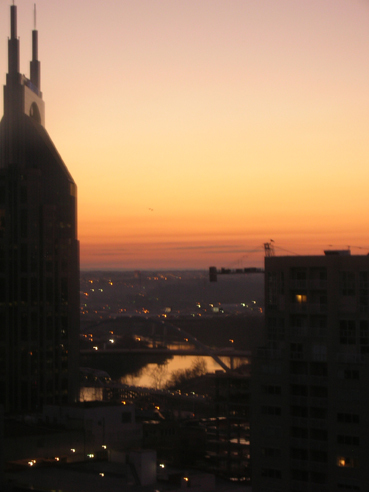 The state comptroller and a key Democratic lawmaker say Tennessee’s school funding formula is so unfair to city schools that the entire program needs to be remodeled. The BEP does not adequately fund the state’s urban districts in part because it understates the cost of educating at-risk students and English language learners. These deficiencies of the BEP force some districts to raise substantially more local funds for education. The urban districts receive less than 40% of their funding from the State. Oak Ridge receives only 37.34% of it’s funding from the State, putting us in the same situation as the urban districts — but without the large tax bases that they enjoy. There’s good reason to work together, if only the urban districts could back away from the TACIR plan and look for something mutually agreeable. Maybe tomorrow’s “Day on the Hill” will be a starting point. 0 comments Monday 26 Feb 2007 | Netmom | Etc. I started on our tax return yesterday, quitting about 9 to get some sleep before a busy Monday… but sleep is an elusive thing when there are unfinished deadline items. The FAFSA application is due by March 1, which pretty much requires having one’s tax return substantially finished to complete. The FAFSA has to be submitted every year in order to remain eligible for the lottery scholarship, and most other scholarships use it as well (like the one Alpha got from the College of Engineering last year, which I hope she can pick up again). If you have a student going off to college next year, get busy — it’s not a quick and easy process! Since I have a busy Monday scheduled — three meetings then leaving for Nashville before lunch — I just acknowledged that sleep will elude me until I have the FAFSA finished and submitted, got up around 2 a.m., and went to work on it. At 7:30, the League of Women Voters will host their second “breakfast with the legislators” for this year, at the Civic Center. I hope that Les Winningham attends, because I want to ask him — in front of an education-friendly crowd — why he filed the bill to do away with the BEP Review Committee, and who he proposes to take over that role. At 9:00, the League hosts another public meeting (also at the Civic Center) where the results of the shopping center survey will be announced. I hope that the results are positive and decisive… but second-guessing what Oak Ridgers might think is never a safe bet, so we’ll just have to see what they say. Tomorrow is the Tennessee School Boards Association’s “Day on the Hill,” where school board members from across the state converge on the Legislature. Tomorrow’s activities begin very early in the morning, so most people will arrive today and take a little extra time to visit their legislators or attend session this evening. While the General Assembly’s website is greatly improved, one thing that hasn’t changed is the posting of committee calendars; there’s no way to know which bills Tuesday’s committees will hear before sometime on Monday. For folks who have to travel a substantial distance in order to attend these committee meetings and provide input (as good citizens should), that’s cutting it a little thin. Shucks, even your local school board has to have an agenda set and sent to the media five days in advance; seems like the legislative committees ought to, too. One of the bills I’d love to be around to hear debated is SB0951/HB0480, which would designate “any person communicating on behalf of a school board, municipal utility, utility district, or any department, agency, or entity of state, county or municipal government” as a lobbyist. Sounds to me like Sen. Harper and Rep. Moore want to discourage input from local governments, because it can be troublesome having your local school board member, county commissioner, or city council member show up to see what you’re up to in the hallowed halls of Legislative Plaza. The lobbyist designation would definitely put a chill on it, if only because of the registration fees and endless reporting requirements. Moore’s day job is 1st Vice-President of the Nashville Firefighters’ Union, which would explain why he’d like to keep City and County officeholders (who generally oppose mandated recognition of municipal employee unions like police and fire) from talking to Legislators. SB0868/HB0569 (transition from the current BEP county model to the TACIR system-level model, which is harmful to 67% of the school systems in the state). I doubt you’re wondering, but just to be clear: I support the first two, and oppose the second two. However, Harper and Moore’s lobbyist bill would probably be pretty effective in preventing local elected officials like myself, with some actual working knowledge of the impact these bills would have on the folks back home, from going to Nashville on your behalf. To me, a “lobbyist” is someone whose income is derived from influencing legislation on behalf of others. It’s a necessary profession, but at the same time, not everyone who expresses support for or against legislation is a lobbyist. Most local officials do so at personal expense, in whole or in part. Stay tuned; I’ll likely post again this evening to let you know what’s going on in your state capitol, through the eyes of a small-town gal. She dropped it. When attempting to power up, she only got those telltale three beeps that mean, “I’m so broken I won’t run at all.” Though her father did translate the initial “three beep” diagnosis, he did not offer any assistance (beyond “you shouldn’t drop it”). And no, since it’s over four years old, no, it’s no longer under warranty. So after taking her for the usual monthly trip to Wal-Mart for necessities like toothpaste and such, I sat down by a window (for better light) and took it apart. I mean, if it doesn’t work now, and isn’t under warranty, what harm is there in looking? Fortunately, as I’ve noted before, Dell posts their service manuals online, so that anyone with a reasonable level of technical expertise and a little courage can take it apart without breaking it. I knew that it landed on the back side, so I focused on the components that seemed nearest the point of impact. I knew that it was still getting power, but that the LCD panel never activated. I tried powering it up with an external monitor to rule out something as simple as the panel connector, but that didn’t work either. 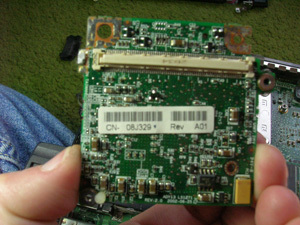 From that, I surmised that the video card might be the culprit. It backs right up to the back of the laptop (connecting to the external monitor jack), which made that a plausible problem. It doesn’t look broken — no burned spots, nothing obviously loose, no broken solder points that I could see (with my trusty but seldom-used bifocals, no less). 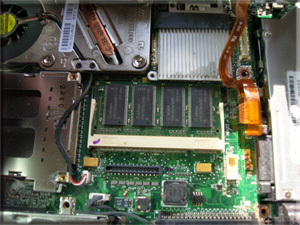 It was, however, full of dust and cat hair — so I vacuumed out what I could, cleaning the video card with some canned air. Next, I re-seated it as carefully as possible, attached the LCD panel connector, and put it all back together (using as few screws as I could, in case I had to disassemble it all over again). Yes, I did a victory dance, right there in the kitchen. The two super-smart college kids in the living room (MathMan, a math major; Alpha, an electrical engineering major) were duly impressed. For a few glorious minutes, I’m more than just the lady that washes towels, fixes supper, and transfers money to Alpha’s checking account. For a few glorious minutes, I am the Geek Goddess who saved the world as they know it. The Governor’s proposed 07-08 State Budget is online — 613 pages, a 3.4 MB PDF download (right-click, “save target as”). Certainly, most of us won’t master the details of the mammoth document, but it’s worth a peek. Maybe worth perusing the highlights, keeping the document on hand to reference as the session goes on. 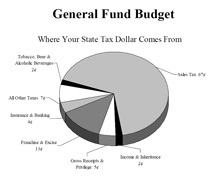 Pie charts to the left and right illustrate where state revenues come from, and where the general fund revenues go. Click either one to bring up a larger, more readable version. 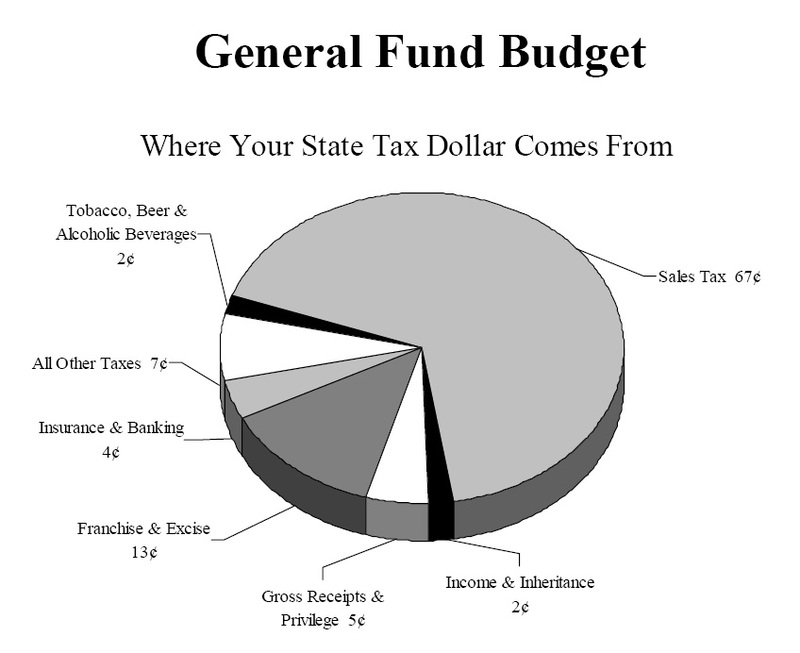 The largest part of the revenue pie (left), is sales tax revenue. 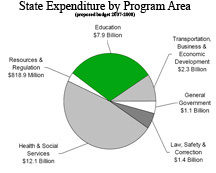 The green slice (right) is funding for education — both K-12 and higher ed. Note that the largest slice of the expenditures pie is health & social services. If education were a larger share of the pie, I suspect that over time, the health & social services part could shrink substantially, and people would still be better off. If education were a larger share of the pie, our graduates would very likely have greater earning power, thereby contributing even more to the sales tax revenue part of the State’s general fund. More money is not the answer by itself, but it’s a crucial part of the first steps needed to begin the process of improvement. In Oak Ridge, we enjoy good standing in terms of educational quality; as such, we have a bit of experience regarding what works (and unfortunately, a little hard-earned experience with what doesn’t). The examples are many, varied, and quite specific, but the common thread is that all require the services of professional educators. The very best professional educators we can buy. Just a couple of the programs utilized to gain measurable achievement are the reading recovery program in elementary schools, and the Algebra 1-T class at Oak Ridge High School. Reading Recovery provides one-on-one intervention for struggling readers in the earliest years, to prevent “losing” kids by third and fourth grades. From Kindgergarten to first and second grades, we learn to read; from third grade on, we read to learn. By third grade, if you can’t read, you’re not learning, and falling faster and faster behind. Algebra 1-T is a course at Oak Ridge High School for those students who struggle with math to the point that they are identified as being at risk of failing Algebra 1 — the “most often failed subject in the history of learning,” according to Dr. Bailey. Rather than being a one-hour class, as all other classes are, Algebra 1-T meets for an hour and a half (half takes up a “lunch class,” which all Freshmen and Sophomores have since they can’t leave campus for lunch), allowing extra time with the teacher each day, learning at a slightly slower pace. The State must elevate education in its budgeting priorities, but perhaps a tiny part of that expenditure should be to catalogue programs that have been proven to work in school systems across the state. What works for one is not necessarily the panacea for another, but to have a list of proven resources available at the state level would be beneficial to all. First though, we have to be able to begin moving forward rather than backward. 5 comments Wednesday 21 Feb 2007 | Netmom | Etc. Listening to the parade of speakers at last night’s City Council meeting, I noticed a common thread among the several who spoke in opposition to the project. Everyone says they’d welcome a SuperTarget, but the opponents tend to be carrying a set of talking points that were circulated by DFET members on their listserv (which I’ve apparently been removed from – I guess I don’t have the right “progressive” credentials). In short, the environmentalists were enraged with the development of Pine Ridge several years ago, and they’re dead-set against something going up there now, lest the guy who bought it and sunk millions into improvements actually make a buck on the deal. City officials have talked as though a contract with Target were already signed and a Target was a guaranteed part of the development. This is not the case. The City proposes to subsidize a shopping center developer who will then market his center to Target. In fact, the City Manager stated quite clearly last night that one of the proposed conditions for release of any funds toward this project is Target’s signature on the purchase contract, with a commitment for a SuperTarget in particular. Another condition is that the City be provided a list of other tenants who have signed leases for the associated stores — who do not have a current presence in Oak Ridge — showing a long enough lease term to ensure that the City’s investment will have some expectation of return over a long period. This agreement has not yet been fully developed nor signed by any of the parties, but the fact that there will be such conditions that must be met before any City funds are released is a reasonable assurance upon which to move forward in the negotiations. Look, I’m one of the folks who got burned by Arnsdorff and his snake-oil promises of mall redevelopment, and as such, view other projects requiring a large municipal investment with a healthy dose of skepticism. When this one surfaced publicly a few weeks ago, I attended nearly every meeting (public and otherwise); I asked a lot of questions. I studied the numbers, and weighed it against what else we might use the money for that would generate a better return. Now, this group is preparing a petition drive to call for a referendum on the $6M general obligation bond issue. That is their right, certainly, but I don’t think it’s wise. Of course, they probably realize that a referendum could jeopardize the whole deal (with the option on the land expiring April 15, but June 5 is the soonest possible date that a referendum could be held), and that’s part of their motivation. I won’t be signing it, and I do hope that the people and the media (Stan, John, Bob — that’s you) are willing to call these folks where there are discrepancies or misinformation being circulated. For everyone else, don’t trust what someone spoon-feeds you; go to the source. At the request of Mr. Young, who had requested rezoning of 110A Newell Lane, the rezoning of that property (from R-1-A single-family residential to RG-1 — allowing horses) was removed from the agenda. The Oak Ridge Boys — Steven Arcangeli, Scott Horton, and Scott Molony, who won the Siemens competition — led the Pledge of Allegiance. They’re on tap to be honored by a Council resolution in a few minutes. A new ordinance was presented and passed to require a motor vehicle to be properly registered before operation on city streets, and to require that any person operating a motor vehicle have his or her driver’s license in possession, and to display it upon demand of a police officer. I think that’s already law, but by making it a city ordinance, the city can now collect the fines for associated violations. A resolution approving the City of Oak Ridge "2007 State and Federal Legislative Agenda" was passed. The scope of the legislative agenda is in the Council packet, here. Tom Beehan expressed grave concern about the cable TV franchising proposals, as that could endanger the agreements that currently allow for broadcast of City Council meetings, School Board meetings, and channel 15 (dedicated to the schools) in general. Next, the item we’ve all been waiting for — a resolution authorizing the City of Oak Ridge to borrow funds in an aggregate principal amount of not to exceed six million dollars through the issuance of General Obligation Bonds. It doesn’t mean that they will borrow those funds — just an authorization to do so should all the stars line up with the GBT/SuperTarget proposal. Jim O’Connor clarifies that the City WILL NOT present any funds toward the project until and unless a contract is signed with Target in particular — as well as the City’s getting the names of the companies that will be co-locating there. Having learned from the Mall fiasco, no money will be released until the City sees the actual contracts with actual tenants, along with a long enough lease term to support a reasonable return on investment. The City funds will really be a reimbursement, so the site development will actually occur prior to the release of any City funds. Abbatiello is concerned that the resolution that Council is presented, does not name the particular project. O’Connor explains that further Council approval will be required prior to the release of any funds, but that if another project came forward, the funds could be redirected to any other infrastructure improvements project. Abbatiello says it’s misleading that all the GBT/Crestpointe people are here, but that the resolution isn’t specific to that project. Abbatiello says he hasn’t decided whether he’s for or against this project (then gee, why does he sound so grumpy?). He says we’re not talking about Crestpointe, not talking about Target, not talking about the map on the screen. Abbatiello says we’re simply talking about whether to go further into debt. Beehan says he feels like the Target project is the reason we’re here. The financial studies do show there’s good reason to consider this proposal, even at the cost of additional debt. Of course, the financials are all estimates, but they’re very good estimates — industry standards, not something that GBT made up. Further, the TVA study shows leakage of $20M going outside of town to shop now. Our whole economy inside of Oak Ridge is heavily reliant on others in our region; just look at the license plates on cars at Wal-Mart, at Methodist Medical Center, etc. Beehan asks why this development is not taking place at the Mall. O’Connor says they’ve looked at the Mall, at the old Food City shopping center on Illinois, at a site on Edgemoor Road, and on the east end of Oak Ridge. The Mall is impractical because of the deed restrictions; Edgemoor Road because of the wetlands; the Food City center is too small (they want complimentary retailers adjoining). Although Pine Ridge is a difficult (and expensive) site, it’s the only unrestricted 60 acres along Illinois Avenue. The GBT rep (Greg?) clarified that this proposal isn’t only about Target — this is a whole development of upscale retailers. Whee!! Upscale!! I know that doesn’t excite one segment of the population, but there are a whole lot of us out here who might actually buy something not made in China. Some of us actually look at the fiber content and thread count of sheets before we buy them. But don’t think it’s a snob thing — the Target circular I read while throwing away junk mail today contained a bunch of real bargains. Steve Jenkins shows the chart, once again, showing the relationship between sales and property taxes. When sales taxes revenues increase, property taxes decrease. When sales tax revenues decline (as they have for several years), property taxes go up (as they have, or services were cut). Jerry Kuhaida (former Mayor) finds the resolution confusing. O’Connor clarifies that a second resolution will be presented to Council on March 19, authorizing disbursement of up to $10.5M to the IDB to further this project. Even if this resolution passes tonight, additional resolutions will be required. Steve Jenkins says we don’t anticipate actually borrowing any money until much further in the process; we don’t want to begin paying interest any sooner than we have to. We have our own reserves, so we’ll be using those funds before borrowing anything. Fred Stephens says he hopes we do get a Target here, but he doesn’t think we have to do it right now — they should be able to proceed and give us time to solicit some assistance from the County. He thinks it’s too much money, and we can get a better deal. Stephens also asks why National Fitness Center’s property tax is lower than projected, and how we could be that far off from last August. The answer to the first question is that getting into Target’s decision queue is driving the time frame. On the issue of assessed value vs. development cost, the property value is driven by a State formula, which incorporates values of like properties all over Anderson County. Unfortunately, it doesn’t matter what they invest — in assessing retail property, it’s based more on comparables than on actual investments. However, this development will drive up the assessed value of all retail property in the county. This meeting is going very long, already. It’s about 90 degrees in the Council room. Wish I had an iced cappuccino. Emily Wetsel speaks next, complaining that the resolution is nonspecific — for "infrastructure development" — when we all know we’re talking about the Crestpointe development. She accuses the City of getting it’s financial information from Target, complains about the impact on her neighborhood (Woodland), traffic, etc. She wants an opinion from someone who’s unbiased, obviously still angry about the "scalped" ridge. Mayor Bradshaw clarifies that the State requirements for a municipal bond resolution are very specific, and this resolution is structured in accordance with State law. Tim Holt speaks next, spouting the same stuff as before — sounds very much like DFET (Democracy for East Tennessee) has structured their talking points and lined up their speakers. It’s been going around on their listserv already. Bill Schamm, the guy who promised a referendum, comes next. He decries a public subsidy for a private corporation. He wants Council to call for the referendum (so he doesn’t have to put on the petition drive). Francis Colvais sees this as another opportunity, and says he hopes that we don’t lose it. Finally! "I don’t view this as a rush; there’s been a lot of work put into this. It’s already flattened — let’s put it to good use." Ellen Smith, Council Candidate, urges Council to defer the vote in order to consider the borrowing resolution in conjunction with the development proposal. She feels this is the wrong proposal for Oak Ridge, in spite of the pent-up need for additional retail. She says this proposal isn’t about Target, and thinks we can bring Target here on our own terms. Glenn Zahn says he’s "very for" this process going forward, that it is the right thing to do. As the owner of a staffing company, he sees the inability or delay in making decisions as being a detriment to a business owner. He asks about the potential for getting the County to contribute, and Mayor Bradshaw announced that they plan to participate in a work session next Tuesday on this very topic. However, the Mayor clarifies that we’re already capturing 75% of what would be County property taxes to defray the bond issue, but they may be able to do more. Parker Hardy, as President of the Chamber of Commerce, tells of working with GBT over several years, engaged in a site search involving a variety of possible locations. Oak Ridge is in the third year of declining sales, a 5.9% actual loss is spendable dollars for Oak Ridge. It’s reasonable to assume that this development would recapture some of the sales tax leakage, and he urges Council to move forward. Chris Wieland urges Council to slow down and re-think funding this process, pointing out the current vacant retail areas. Ray Garrett supports the idea of subsidies or support for retail development. Although he’s not certain that the present proposal is the right one, he does ask Council to go forward with the bond resolution and do something… maybe buy the mall and lease it out at the minimum rate in order to get retail in. Another thought is to buy the property along Illinois where there used to be a sawmill, a driving range (and a dump before that). Jim Cape points out that just a few years ago, he thought that Home Depot would be a dumb idea. He was wrong. The second critique he’s heard is that of geology, but Home Depot overcame that problem. The third concern he’s heard is the $10.5M, but this isn’t a housing development — it’s retail, generating money for schools and city services. "I think you’re voting for the future, and we need it very much." Thomas Tucker insists that people from Solway and Hardin Valley are NOT going to come into Oak Ridge, because the traffic is too heavy (he lived in Solway for 16 years). He claims that the "real cost is $21M, not ten and a half." Elizabeth Davis says her family came here for the schools, and found what they were looking for. The growth in Oak Ridge is "heartwarming." Oak Ridge is a "little southern," moving at a slower pace. She expresses her gratitude for the Council’s work on this project, and urges them to move forward. Bradshaw: the actual assessed property value is up 20% since 2000, and the tax rate was reduced 7 cents. We’re no longer at the top of the list in property tax rates. However, operational funding for our schools is a continuing issue, as well as the expressed dissatisfaction with our lack of shopping opportunity. Because school funding is so closely tied to sales tax revenues, our lack of retail is hurting the City and the schools. We’ve got to re-learn our shopping habits. We’ve got to be serious and reverse this trend.